Turns out the typhoon had mostly missed Jeju Island, and we didn't end up with nearly the amount of rain they were calling for. Good thing, because we had sightseeing plans and we were going out to explore, rain or shine! From Seogwipo, we walked up to the bus stop near the Jungang Rotary (not the one on the rotary) and hopped on the number 701 bus that follows the coastline around the island. We were headed in the eastern direction, to the Manjanggul Lava Tubes. It cost 3,300 won ($3.75) each for the hour and a half bus ride. All of the buses have these fancy monitors in them that tell you the time, route number, weather, bus stops, and tourist info. Our bus went by the Jeju motion picture museum. Korea is the only country in the world that produces movies that are more popular and take in more money than Hollywood films shown in the same country. Who would have thought? Sorry, not many pictures from the bus. Or at least not many that are worthwhile. Tough taking pics from inside a window on a moving bus! The bus only stops at the highway, so if you're headed for the lava tubes you have a 2.5 km (1.5 mile) walk. Or, you can take one of the taxis that are inevitably waiting by the highway at this point. Taxis are cheap, but we had already sat for an hour and a half and decided to do the walk. Kevin, beside some interesting plants and flowers. 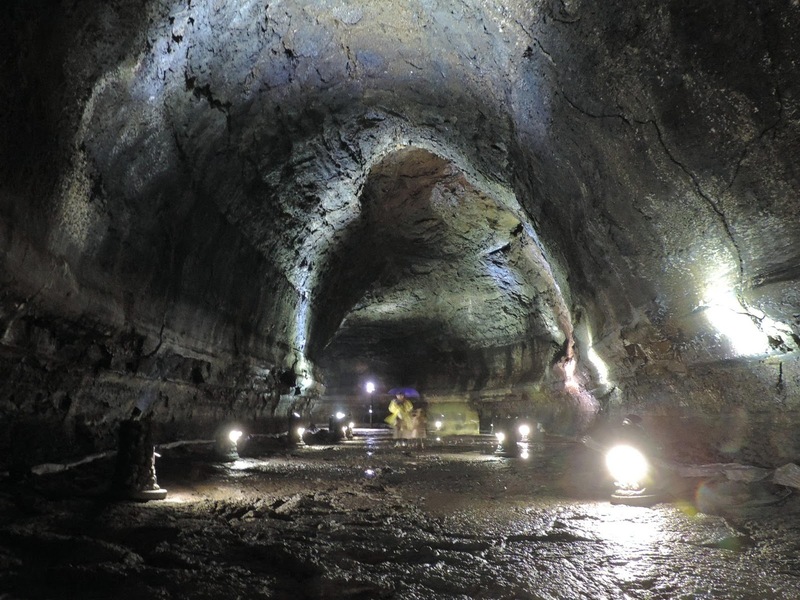 The Manjanggul Lava Tubes are a UNESCO World Heritage site. They are about 7.4 kms (4.6 miles) long, however only one km is open to the public. It is one of the largest lava tubes in the world. Admission is a very reasonable 2,000 won ($2.20) per adult. A lava tube is actually a cave that was formed by molten lava making it's way through the rock. As the lava flow stops, the cooling leaves a tunnel, with a fairly level floor. We were warned today that because of the rain overnight, it was still raining inside the tube! Leakage from the rainwater through the ground and the ceiling and walls of the tube. Yep, lots of dripping water. Some people even had umbrellas. The lava leaves interesting decorations on the walls. And this wall has a big crack in it too! Another formation left behind from the lava. This gives you a good idea as to how much water was coming in from the ceiling! The largest lava column in the world. And that was about it. We like to visit caves, and this was a little different because it's not a normal cave. Worthwhile, especially because of the reasonable price. We walked back out and found a snack bar where we bought a kimbab roll each. Our favorite Korean snack! Seaweed rollup with rice, veggies, and usually egg and some kind of sausage. Makes for a filling snack, and it's usually fairly cheap. This one was actually a bit expensive, at 2,500 won ($2.75). But it was good, and it hit the spot! Neat statue depicting the lave tube and the lava column. We walked the 2.5 kms (1.6 miles) back to the highway and were really lucky with our timing. The bus was just pulling in! We had to run a little bit to catch it! We were charged 1,300 won ($1.40) each for the 20 minute or so bus ride from the highway outside the lava tubes, to Seongsan Ilchulbong (Sunrise Peak). 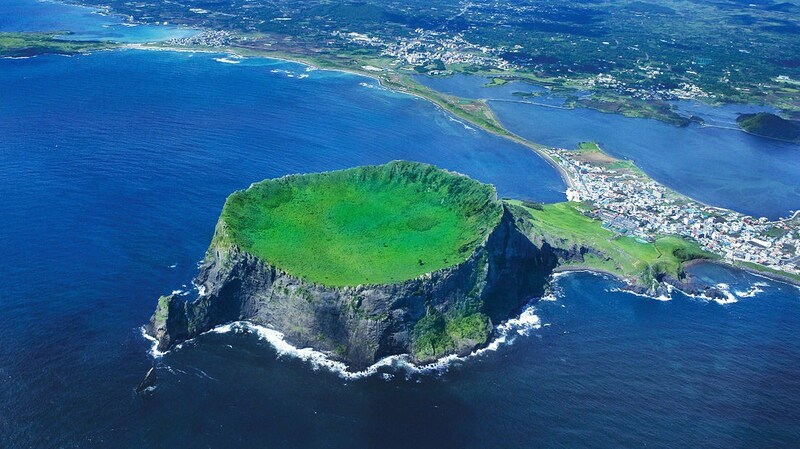 It's a volcanic crater that sprung up from the ocean about 5,000 years ago! Sure doesn't look the same from this angle, does it? Can you see the stairs you have to use to come back down? Here, I'll zoom in on them for you! Oh, by the way? It's just a little touristy here! Dunkin Donuts is actually a popular franchise here in Korea. They also love Starbucks here! Lots of tourists! Mostly from Japan and China. Starting to get a nice view. The lava makes interesting formations. And, the view from the top! Other tourists at the top. The crater itself is not that much to see. Now, to take the stairs back down! Kevin, in his Tilley gear! Jeju Island is famous for "Wind, Rocks, and Women"! With regards to the "women" part of that phrase, it is the traditional female divers in this area that are something of an anomaly in the world. From wikipedia... While in 1950 there were as many as 30,000 haenyo (female sea divers) on the island, in 2003 there were only 5,650 sea women registered as divers, of whom 85% were over 50 years old. In the early 1960s, 21% of women on the island were free divers, providing 60% of the island's fisheries revenue. With the number of sea women declining and with tourism giving Jeju men more opportunities, it is unclear what will happen to their daughters' status in their communities and home, though it is unlikely that the matriarchal family structures will continue to survive. As of 2014 only about 4,500 haenyeo, most aged over 60, were still actively working. These women are ocean divers! They were selling seashells by the seashore! We took the bus back home, and it was dark by the time we arrived back in Seogwipo. Another great day out exploring. We've only got one more day here which is too bad because we won't see everything we wanted to. Oh well...we'll have to come back some day! Another fantastic post! I have never seen a lava tube. Reminds me a little of Carlsbad Caverns or Mammouth Caves in Kentucky? I love the sushi roll/snack. And there's Dunkin Donuts -- would have never guessed one to be there. Glad the typhoon and mostly missed you all. The lava tubes are like caves but they are fairly circular and fairly uniform, they also don't really have any of the common cave features like stalagmites and stalactites. Starbucks definitely seems more popular than Dunkin' Donuts though. You certainly scoped out some really interesting things to see on the island. Lots packed into a relatively small area! The lava tube was huge! It definitely would have been something to see lava going through for sure but if we saw that we wouldn't be around to tell about it because we would have been burnt to a crisp. There is so much to see on just the island itself, I think you could easily spend 2 to 4 weeks here, especially if you like hiking. I found the women sea divers the most interesting. Kind of a shame their numbers are dwindling. It is really because they apparently are quite something to watch. We were sorry that we missed seeing them dive. I guess we will have to check out the lava tubes in Idaho some day. This tube did have the lighting along the route but the walkways were only at the very beginning of the trail with steps taking you down a short length in the center over some rocks and then at the very end near the column otherwise it was the original surface which was very rough with lots of puddles. You had to walk with caution. I am getting such an education! The women sea divers are amazing and, as usual, great pictures! Thank you! Thank you one again Kay. We wish that we could have seen the women divers at work but we were to late for it. I am sure it would have something very unique to see. Yep, they have a big movie industry here! It wasn't much different than being in a cave but it was pretty cool knowing that so much lava moved it's way through the ground to create these tubes. Definitely quite an experience. Those plants look like the yuccas we have around here ... they flower just like the ones in your photo. They look just like the ones in Mexico. Yes yucca, just like the ones in Arizona too! And in Oklahoma and Texas! Isn't it funny how somethings can be found in such a diverse area! That was a great blog post. Looks like you guys really took advantage of the day! Kinda wish we were still traipsing around Toronto or Ottawa! When we are traveling there aren't too many days that we just sit around and do nothing! We don't what to waste a moment, especially when we know that our four weeks here isn't going to be enough time as it is. I am really enjoying your blog and your travels. Thanks for sharing! Thank you very much and thank you for taking the time to post a comment. We love hearing from our readers. We were supposed to see the women divers on Friday when we were there but they cancelled the show due to the high seas caused by Typhoon Vongfong. Your tour today has essentially recreated what we did on Friday! The only thing different was we went to the Stone Museum and a folk village as well. Pushed publish too fast! I was going to add a thank you for showing us what we missed, the women divers! When you take the local bus it sort of slows you down a bit but we really enjoyed what we saw and did. We realize that we just don't have time for everything. We didn't get to see the women divers actually diving unfortunately, we were to late for their last show. I am sure that it would have been interesting to see. I am glad that you were able to pack so much in on your visit to the island and even then I am sure there was still more that you would have loved to have done. There is way too much to do here. Still I am glad that you got to see as much as you did! I bit that it was nice to just lay back on the couch and relax for a change, you really had a couple of very busy weeks. Now I wish we had visited the lava caves at Craters of the Moon National Park in Idaho last year. We pass because we thought it was "just" a cave and John doesn't do well with them. Thanks for the photos. Another wonderful day in Korea. Nan you can always make a trip back there one day and do it then. They are really just a big cave in a sense but it was still pretty neat to see and experience. Really enjoying your trip. Have you seen any motorhomes yet ??? Thanks Steve and Glen, we are enjoying it as well. No we haven't seen a "motorhome" but today we saw some caravans and a couple of 5th wheels.